It is a thing. It’s a REAL thing. And the reality is, it isn’t just for November, sitting around the table sharing the one thing your thankful for that year. It’s a way of life. Don’t get me wrong, I love the fact that people find something to be thankful for on Thanksgiving. There are some people going through a whole lot of stuff right now, and it takes a lot to muster up thanks when your anything but. I know. That was me last year. Last year, I was afraid, depressed, and on the brink of losing my right mind. I was in a dead end job that I felt trapped at, watching my husband suffer silently while trying to find the strength and courage to find one job after another after spending years in the same job, with the same employer. We literally were the couple whose lives hardly changed, yet today I am grateful for every single change that was coming our way. I couldn’t see the BIG picture. I had no clue how we were going to be better off as a family, nor did I know that I would become the woman I am today. Last year, I was praying we wouldn’t’ go through the tradition of “What are you thankful for” because in all honesty, with every breath I was losing hope, faith, and strength. As I sit and reflect, I realize that the prior year to last year was one where I was learning more and more about the power of gratitude. Simply being thankful. Finding JOY in the simple moments of life. At the time, I felt blessed beyond measure but with time, I allowed my heart to become hard with the life lessons that were right in front of my face. I now know, that I was given the assignment of finding Gratitude in 2015 so that it would help get me through the hard parts of 2016 and 2017. The second half of this year has been amazing, and continues to gain momentum. I will attest that it is indeed easy to have the spirit of Thanksgiving in your heart and soul when life is easy. It is a hell of a fight to experience when it feels like you are on the last moments of hope. I can testify that the little bit I had left in me, was what got me through those tough months. Months where I didn’t know if we were going to end up without a home. Months, I worried about the “damage” being done to the kids because I discovered I could no longer make promises, without letting them down one way or another. The promises ended, and on a good week, I could surprise them with a little treat ~ something that would remind them that I loved them and was doing everything in my power to keep us afloat. In those months, I had no clue about anything ~ but discovered that love out-stands defeat. Love is the glue that does hold the family close when the world tries to rip it apart. Kindness is a gesture that none of us should expect, but all of us should have a hand at dishing out to others. This year the spirit of Thanksgiving goes deeper than the occasional “I am thankful for” because in reality it a spirit of life. We breath it, breath it out, and feast on it every day. It is a part of who we are, what we are made of, and most importantly, what we believe in. The words that come out of our mouth, how we treat loved ones and strangers alike, the thoughts that possess the passing of time. 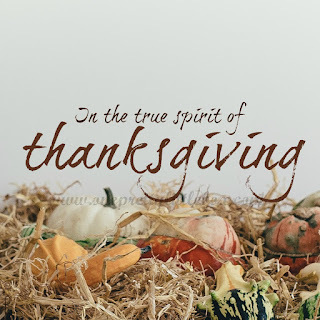 These are what the spirit of Thanksgiving that lies deep within us reveal. These are what the world sees, and the secrets hide. Breathing in, breathing out we are thankful. We can choose to be thankful for the things that have made us who we are today, or we can choose to be bitter. We can choose to be thankful for those who have impacted our lives, or we can choose to be forgetful and unkind. We can choose to be lovers, or haters. Either way you have it, you get to choose the level of your spirit of Thanksgiving. It’s there, you just might have to slough off some baggage to find it. This year I am grateful for the lessons we have learned as a family during a time of insecurity. When your not sure how your going to make it, yet God shows that He will provide time and time again, there is no reason to ever doubt His greatness and the fact He has a plan for your life. I am thankful for a new career that had led to freedom in many ways from financial to emotional freedom. I have found myself again ~ the confident version of me and I missed her! I am grateful for my husband, his companionship, the way he loves me completely. I am thankful for our children ~ they bless me daily. I am so very thankful for our home ~ our safe haven from a cold cold world. I am blessed beyond measure by many material things that I can't even begin to recall them. Thank you for being a part of my life this year!